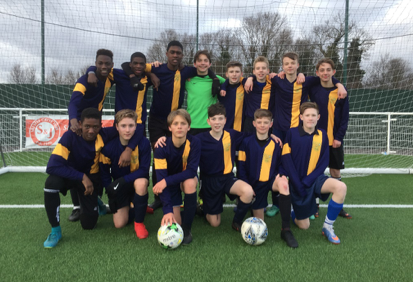 The Ockendon Academy’s Year 9 football team faced St Bonaventure’s school in the Essex Cup semi-final at Aveley stadium. This was The Ockendon Academy’s first time in reaching the semi-finals which is a huge achievement for the students and teachers involved. It was a match that lacked goals from both sides, but each player held their own until the very end. Weather conditions made play challenging, with few chances available to either side in the first half. In the second half the game opened up and Samuel Griek, had to remain alert as he parried a good shot behind the goal for a corner. The best chance of the game came late on when the ball landed at David Roberts’ feet just inside the area, but his shot sailed over the bar. Both teams had to endure a further 20 minutes of extra time and, despite penetrating runs from Jack Hellen and Aleem Balogun, Ockendon still couldn’t find that important goal which meant play had to go to penalties. Kaelan Casey from Ockendon scored the first penalty, followed by an away goal. Four other goals were scored by Ockendon students, Kai Dennis, Rielly Johnson, David Roberts and Aleem Balogun who sent The Ockendon Academy into the Essex Cup final. Both teams played brilliantly and the game was as exciting as it was unpredictable, with great sportsmanship throughout. The Cup Final date is to be announced shortly.